So you’ve applied to a job and had a recruiter or hiring manager reach out to you. They’ve got a job that interests you in a company that you’d enjoy working for. You’ve passed along your resume and LinkedIn, your professional references, and even had a good conversation with the recruiter about the role. Then you wait to hear back. And wait. And wait. 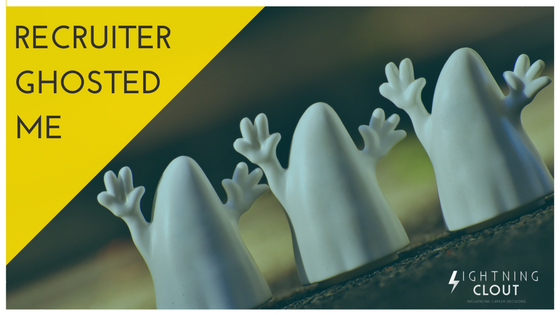 Looks like your recruiter has ghosted on you, but don’t get upset! There are several reasons this could have happened, and below we share those reasons and offer follow-up actions for you to take to ensure you and the recruiter both achieve the best results. Lack of organization stems from changes that are happening in the company. Sometimes the recruiter gets caught up in other things and forget to reach back out to you about the status of the role. However, be consistent! Call, email, connect on LinkedIn with the recruiter to let them know you are still interested. Sometimes the recruiter doesn’t know how to break the news to you about not getting the role, so they may not contact you. You may have been a strong candidate, but they found a better fit. It is okay to reach out to the recruiter and ask for an update. If you are still interested in the company, ask them to stay in touch regarding roles that fits your background. If you want to find out why you were not selected, this is your time to ask the recruiter for feedback. Explain that you want to know how you can improve so that at a future interview you can secure the position. Showing that you are focused on improving and growing professionally will definitely help you stand out should a future role become available. Jobs get cancelled or postponed all the time. Budgets can change, and the company may no longer support that position. If you are interested in the company, look for managers of the team you would like to join on LinkedIn. Connect with them and send a message about your interest! Also, apply to similar jobs at the company. You can always move around once you get the job! The interview process can be a long procedure, with several steps and people involved. This is especially true in larger organizations. You may apply for the job and get an interview and days later the job is posted. Do not let this discourage you. Often times the same job will be reposted because the recruiters want to make sure they have found the best candidates. During your wait time, make sure to stay in contact with the recruiter and the hiring manager. Believe it or not the recruiter could have just forgot to send you a courtesy email. Staying in touch with your recruiter and maintaining a solid relationship with them can help your career in the long run. Many recruiters communicate with hundreds of candidates per week and it can be easy to miss a follow-up. Should a new opportunity become available they will easily be able to contact you because you will be at the forefront of their mind. That is why it is important to stay connected with the recruiter after your interview. Sending them a follow up immediately after your interview as well as five business days after your last interview will allow them to easily update you on your status. It can be frustrating to have a recruiter ghost on you, but don’t lose your head. It’s extremely likely you haven’t heard anything because of one of the reasons mentioned above. The best thing you can do is keep your cool, reassess the role and your current goals, and stay in touch with the recruiter and the company.